Thanks to everyone who came to my dog nutrition seminar on Nov.3rd ! Hope you received some valuable information. Personally, following our speaker Patti Howard‘s suggestions I started integrating raw food into my dog’s diet with a raw meal in the morning (consisting of raw beef and Honest Kitchen’s Keen dehydrated food which has tons of veggies!) and her Acana high quality dry food in the evenings. She’s made the transition with NO trouble at all and seems to love her food. She now eats with gusto and actually wants more! Apparently, she wasn’t finicky – she just had finer and more diverse taste than I gave her credit for! So once again – Thank-you Patti!! And thanks to Melanie Carroll and everyone at Fido-n-Scratch for hosting! Below is a quick and easy dog nutrition reference guide that covers the main topics discussed during the talk and lists any recommended products. For anyone in the area, most of the products can be found at Fido-n-Scratch either at their Leschi or Mt. Baker location. However, if this is out of the way for you, I’ve provided links where you can purchase these products online. I’ve generally given links to smaller sizes of these products in case you’re trying them for the first time. For the frozen raw foods, you’ll need to check the freezer aisle at your best local pet food store. If you try any of these products and/or suggestions, drop me a line and let me know what your experience was! Q. What gluten-free dog foods would you suggest? **As a general rule always try and stay away from Corn, Wheat and Soy in your dog’s diet. These ingredients mean gluten is present and they are also common triggers to allergic reactions which can cause not only physical issues, but behavioral ones as well. Q. What foods will help you switch your dog over to a raw diet. A. Ideally a dog’s biology makes their digestive tract capable of safely passing the bacteria found in raw food. However, due to modern feeding habits many dogs’ digestive tracts no longer have the appropriate amount of probiotics needed to handle raw material therefore they may at first have a difficult time switching over to Raw food if this is not addressed. Here are some foods you can add to your dog’s diet in order to replenish those probiotics and make the transition to raw easier. Goat’s milk – Give a ¼ cup to your dog 15 minutes before or after they’ve eaten. Raw Okra – Blend the okra in a blender in advance and keep in the fridge or freezer. Add to your dog’s raw meat during meal times. 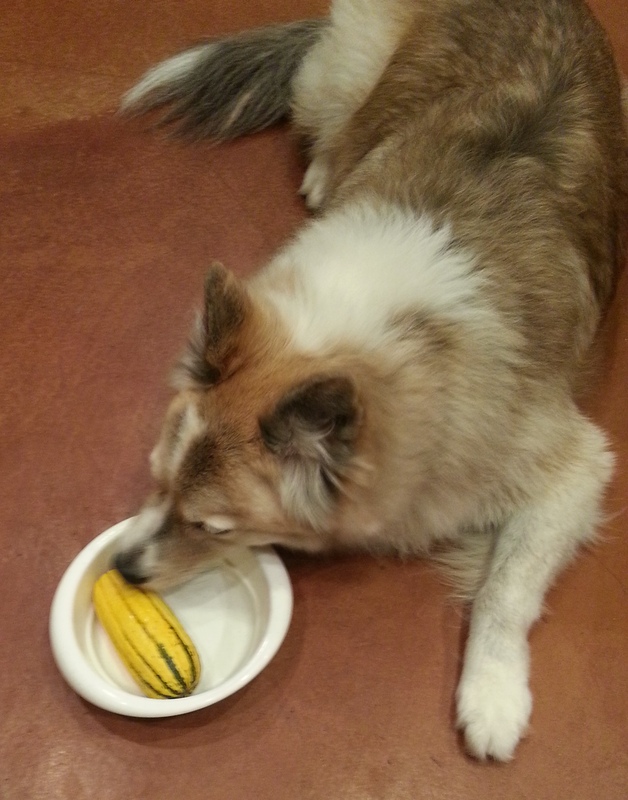 Pumpkin – Give your dog a Tbsp. of pureed pumpkin (canned with no spices is great) with their food. Aloe Vera Juice – Add a Tbsp to your dogs water, can help soothe digestive issues, as well as help balance ph. Q. What are some options if you want to feed raw, but don’t have the time to prepare fresh. Prepare your own frozen raw food for the week, in advance. Blend an array of veggie/fruit choices, chop meat and package in freezer safe Ziploc bags. Q. Do dogs only eat grass when they’re sick? A. My business partner, Prescott, wrote an excellent article to the Examiner, where research says no, they do not eat grass ‘just because they are sick’. Not only does it taste yummy, but those spring grasses must be like a taste of sunshine! For those dogs that do have intestinal upset it can help, and also has been shown to help rid them of worms with the blades of grass carrying from their intestinal tract. Studies have also shown that if Mom-dog grazed on grass, her pups will have higher incidence of doing so themselves. For dogs not getting any ‘fresh ingredients’ in their daily diet, it must be pure heaven to forage for the just the right grass! Q. How do you prepare raw bones so that you can be sure there is no risk of choking? A. We cut risk dramatically by feeding raw vs. cooked bones, and if you are feeding poultry necks, it is a good idea to pulverize them a bit with a hammer to help your dog get accustomed to chewing on those types of bones. Poultry backs are also very popular, and can be prepared in the same way. Unfortunately, there is no such thing as ‘no risk’, however so it’s always good to supervise your dog while eating bones. Also, be aware of how your dog eats. If they aren’t a chewer and just swallow everything you may want to first try various sizes to see how your dog handles them. Q. What are the top 3-5 supplements and/or foods you would add to an older dog’s diet to avoid typical senior dog issues? Animal based omega 3 fatty acids, so prepared fish oils that you are taking yourself! or salmon, mackerel, sardines packed in water and rinsed. An exceptionally high quality product is Iceland Pure Pharmaceutical Grade Salmon Oil. Calcium, I use Animal Essentials Seaweed Calcium. I also regularly give raw bones to satisfy that need in place of the powder. A probiotic, especially if your dog is on antibiotics of any type. We want to re-establish good intestinal health consistently, and this is good way to provide that. A great probiotic product is Total Biotics another is ‘Inner Garden’ which can be found at www.gobeyondorganic.com You can also add a healthy Tbsp of PLAIN yogurt (no sugar please) in their food each day. Q. Can my tap water affect my pet’s sensitive stomach and what can I do to find out or fix this? A. Chlorine is an agent that can disrupt your dog’s digestion, so the rule of thumb is that if you filter your own water, do so for your animals. Q. How much should I feed my dog? A. When feeding raw, the standard number is 2-1/2% of their ideal body weight. So a 100lbs dog will get 2-1/2 lbs of food per day, split between an AM and PM meal. Take note that this amount is accurate for the ideal ratio of food, which will fluctuate with the type of ingredients that the food is composed of, exercise level of dog, breed, etc. So seek help from professional to help you set up a good standard recipe, which can be altered with seasonal ingredients, sale items, availability, etc. Q. What should I look for when reading a nutrition label? A. Add up protein, moisture, and fat percentages, subtract this number from 100% and that is percentage of carbohydrate load there is in the food. The optimal amount of carbohydrates to have in a food is 12-18%, so you will quickly see how kibble disrupts the ideal balance. A dog’s primary energy source is fat, not carbs, so this is an important number if you’re finding that there are physical or behavioral issues with your dog. Remember you can also bring your dog to a nutrition specialist to find out more about normalizing this percentage. Patti Howard, BS, CCS has her Bachelors in Holistic Nutrition, and with her 11 years of working with dogs became certified in Canine Nutrition from Building Better Bodies with Canine Nutrition, with Dr. Ava Frick DVM as Instructor/Mentor. Patti is a Behavior and Nutrition Specialist and COO with The Pawsitive Packleader, Inc., which services the greater Seattle area. She consults individually and speaks publicly on Canine Nutrition. The Pawsitive Packleader Inc., with a scientist on staff, is committed to the research and study of nutrition on behavior. Calling all dogs to the table! Posted in Community Event, Competition, Dogs, Expert Advice, food, Health, Seattle and tagged dogs, Event, Expert Speaker, food, Health, nutrition tip. Bookmark the permalink. Another great post Staci! Really informative! Thanks Staci! We are the gluten free folks from Nov. 3rd. 🙂 We have switched Roscoe to an egg with GF kibble in the morning and blended veggies and raw chicken in the evenings. He loves his food, bowel movements are much more normal, and he seems healthier. I appreciated the information about keeping the veggies and meat separate from the kibble because they digest at different rates. I think we’ll try the goat milk for a special treat. He also got a chicken neck for the first time and LOVED it. He did eat it rather quickly. We might switch to turkey necks for next time and hopefully it will last longer for him. Question – the raw chicken I’ve been including has been boneless. What about a drumstick? Is that too big? Also, if I wanted to branch out and include other meats, is ground meat okay…or should I be sticking to certain cuts of meat (for example, raw ground beef vs. raw steak). Thanks again for your expertise. Hi! Totally remember you guys and was happy you brought up the topic – turns out it was really helpful for a lot of people. Great to hear that Melanie and Patti were able to help! Now here’s my two cents on the ground vs steak question. It’s fine to feed dogs ground beef, but there are a couple things you may want to take into account to make sure you’re feeding them the best version of it. One thing you should do is make sure you get the extra lean beef, especially if you want to feed it to them often. So that means if it’s not labeled on the package skip it because there’s a lot of ridiculously fatty ground beef out there. About the leanest ground beef you can get is 93/7 which means it’s 93% lean beef. Also, a dog’s digestive system is more equipped to handle bacteria like e-coli especially if they already have a healthy digestive system. However, if you’re looking to keep the bacteria down to a minimum try going to a butcher and having them freshly ground a steak. Bacteria like E. coli and salmonella are found only on the surface of a piece of meat—they don’t live inside the muscle fibers. So if a butcher properly handles and grounds a whole piece of meat it can help cut down on these types of bacteria. Since I know you’re in the area I can recommend a really great butcher, Bob’s Quality Meats in Columbia City. Pretty sure they’ll ground for you, PLUS if you’re looking to branch out they carry a really varied selection of meats like venison and duck. Last thing, on the topic of the drumstick – whether it’s the right size will really depend on the size of your dog and how he eats. If he’s a medium sized dog and actually chews and gnaws on things it shouldn’t be a problem. If he’s huge and just swallows things whole then maybe you wouldn’t want to risk it. The good thing is that a dog’s digestive system is really good at breaking down fresh bones and as long as there’s no blockage, they’ll pass it or spit it up. Big thing is if you’re worried you should definitely watch while he’s eating it and if he’s the type that will growl or run away from you if you try to take it then don’t give it to him to be on the safe side.